In the early part of the 20th century, James Weir owned a general store near Market and Van Ness Streets in San Francisco. Later, he owned a bar in the same location. He named it ‘Connie’s’ after his daughter. Constance Marie Weir was born on March 8, 1924. James’ wife was not Connie’s mother. As legend goes, Connie’s father had a mistress who fell pregnant by him. When the child was born, James took Connie as his own and raised her with his wife. Connie never met her biological mother nor did she know the circumstances of her birth during her lifetime. She did remember that the woman she called mother was very strict. Happier memories were of times spent with her mother’s friend who was in service at the Filoli Estate, south of San Francisco, and who lived on the grounds with her daughter of Connie’s age. Connie and her mother would visit them and were even allowed to stay the night in the servants’ quarters there. The owners of the estate had an ill child and Connie recalled the entire third floor of the mansion being made up as a hospital to care for him. During World War II, Connie was an Army nurse stationed in the Presidio of San Francisco. Towards the end of the war, Connie’s unit was set to ship out to Europe. The day before sailing, Connie caught a cold and had to stay behind. She told me she’d always wondered what might have happened had she sailed that day. Later she married and had two daughters, my mother, Melody, and my Aunt, Cathy. Her husband, Monti Crooks, struggled in silence with the knowledge that he was gay and hoped that marrying Connie would somehow change who he was. When he could no longer stay silent, they divorced. Monti would go on to find his true love and live openly in the San Francisco Bay Area gay community. Connie also found true love in her second husband, Ed Marion. He adopted her two daughters and they moved to the San Francisco suburb of Belmont. In 1960, Connie gave birth to Ed Jr. when my mother was twelve years old and my aunt ten. Four years later, Connie’s true love died of a heart attack in their bed. “I think your father is dead,” she yelled to her daughters sleeping in their basement room. He was 49 years old. Connie had dark days after that. My mother, a teenager then, took on much of the responsibility of running the household while Connie grieved. She never remarried after Ed passed. I was born eight years later and Connie sold the house in Belmont to my parents where they still live today. She and Ed Jr., just barely out of high school, rented an apartment in the nearby town of San Mateo. She worked as a night nurse at the hospital so when I visited her she was always in her dressing gown and robe, either about to go to bed in the morning, or about to get ready for work in the late afternoon. When we went out to dinner with her, she wore her scrubs and ordered the breakfast plate. After Ed Jr. got his own apartment, Connie became ill and moved back into the Belmont house with us. She lived in the same basement room where my mother and aunt had slept twenty years earlier. Connie knew how to play the piano and speed-read. When I had a singing audition for the school musical, Connie would accompany me on the piano so I could practice. When I got behind on the reading for a book report due on Hemmingway’s ‘The Old Man and the Sea,’ Connie speed-read it for me and told me what it was about so I could finish my work on time. It was one of those secret gifts grandparents give that they would never have given as parents. 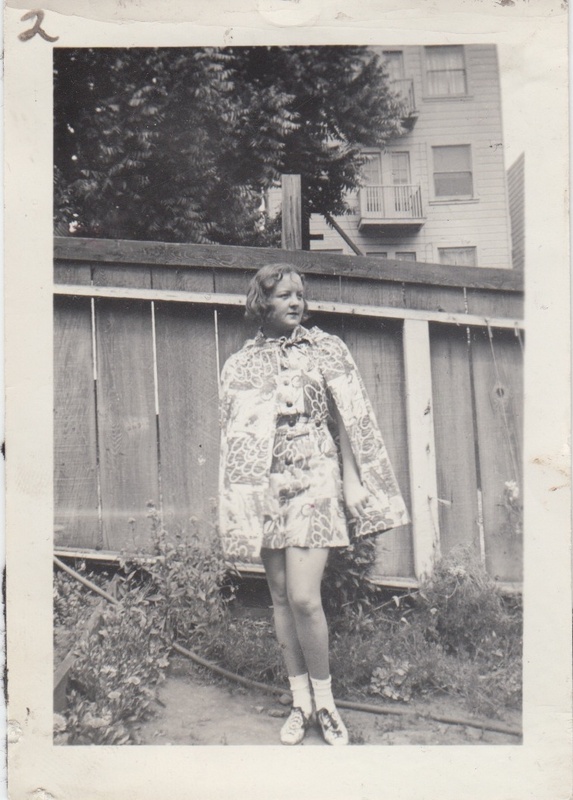 She was a legendary San Francisco Giants fan and listened to the games on the small transistor radio she carried. Connie knew all of the players’ stats. She also knew about the rules of fashion and good taste. Connie was glamorous. She had a Betty White style blond coiffure and liked to wear coral colored lipstick. Her fingernails were long and painted. She wore silver rings set with large, southwestern Turquoise. One time, I modeled for her a shorter skirt I was going to wear to school for the first time. She showed me how to properly sit while wearing it and which angle of my crossed legs would be the most flattering to display outward. When it came time for the homecoming dance my Freshman year, she convinced me not to wear the more mature dress I’d borrowed from a friend’s older sister. 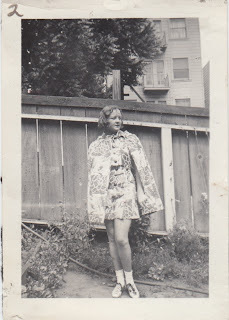 Instead, she suggested that I let my mother buy me the new, more demure, age appropriate dress from Macy’s. It always seemed to me that my mother really valued Connie’s input, a rare thing in any mother and daughter relationship. Eventually, Connie became too sick and was admitted to the hospital during the summer between my sophomore and junior years of high school. She was only sixty-four years old but she was dying. As I cried at her side in the intensive care unit, she reassured me that there were people that would listen if I ever needed someone to talk to. I was confused at how she could be concerned about me at a moment that was so singularly about her. Even though her heart always seemed to me heavy and life-worn, I think it created a stillness inside her that made her the very best listener. Connie had a vast calm, probably from having been a nurse for so many years. She made people feel safe. She attracted those in need. Little children and animals loved her. You speak of such sweetness! So far, every story you have written about your family has had a profound impact on me. After reading this story about Connie I had tears of appreciation and inspiration in my eyes. I also noticed myself confirming an unexpressed wonder about you that I have entertained ever since the first time we met that goes something like this... I wonder if Amy grew up surrounded and influenced by strong, creative, expressive, talented, aware, attentive and talented women (in addition to your mom). How fortunate for you and for Nicholas and for Lennon to have such a rich ancestry.